I grew up around the disease of addiction. My mother was an addict and my father left when I was one. I had a very bad childhood. As a result, I was emotionally damaged. I can remember being a young child and feeling out of place. I was very insecure and socially withdrawn even though I had friends and I was part of the popular crowds. I never felt okay. When I used, I did feel okay. When I was high – or when I was with a group of people getting high – I felt okay. When I was ten, I was adopted by distant cousins I had never met. I had this perception that if everybody would just leave me alone and let me do what I wanted to do, I’d be fine. I got locked up in my first drug treatment at the age of thirteen. When I was fifteen, I dropped out of High School. I ran away when I was sixteen. I got an apartment with two friends; we lived in the ghetto in Manchester and got high every day. We didn’t work. Instead, we dealt drugs. We started transporting across the country. It got to the point where I didn’t want to use anymore but I had no choice. I couldn’t face the consequences and all the people I hurt. My adopted family would show up and my roommates would tell them I wasn’t there. The last time they came looking for me, I was the only one home. I opened the door and I got arrested. That was November 24th, 1997. I was seventeen. My family, who I hadn’t talked to in over a year, told me they couldn’t support me any longer. I was no longer a part of the family. They told me they loved me but they needed to say goodbye to their son. They gave me the choice to walk away or get help. I chose to get help. I got into a facility, but my family stood firm on not helping me. When Family Day came, they didn’t show up. To be honest, it was one of the best things that could have happened to me. It made me take responsibility for my life and what I was doing. No one said: “Oh, it’s going to be okay, everything is fine”. It wasn’t fine. What I was doing – and who I was for years – wasn’t fine. I was hurting people. Their actions made me take responsibility and helped me have the desire to get clean. After I got out of rehab, I immersed myself in 12 Step recovery. People opened their arms, became my family, and saved my life. That is a recurring theme: people loving me for who I am and wanting to help me because I want to help myself. Early in recovery, I was convinced that a relationship was going to fix me. That’s all I thought about. I was very unhealthy due to my abandonment issues. I was insanely jealous and controlling, but I was actually a very loving, caring, and nice person, too – so it’s kind of an oxymoron. I came to realize that the reason I was so controlling and jealous is because I didn’t believe anyone could really love me. I thought that if I could hold them close then maybe they wouldn’t leave me. From the outside, you would look at me and think I was doing well, but when it came to relationships, I was very dysfunctional. There were still periods when I would curl up in a ball and cry because I felt like I was all alone in the world. At five years clean, I had an awakening. I got very embarrassed at a convention. They asked me to be the main speaker. I was yelling at my girlfriend because she was talking to another guy. A thousand people came to hear me speak as a leader in recovery, but I acted like a lunatic. I called my sponsor and he told me: “You need to do the work. This stuff is not going to change unless you do the work”. Shortly after that, I wrote a 4th Step. You take a moral inventory of yourself – your life, your behaviors, and your patterns. I had a lot of wreckage. It’s really not about using drugs. It’s about the internal battle we have. That’s why we use things outside ourselves to feel better. I’ve been through a lot of adversity in my recovery and I’ve gotten through it clean due to a belief in improving who I am. I view circumstances in life – whether they’re difficult or beautiful – as opportunities to grow. When I had nine years clean, I met the mother of my children. I had done enough work on myself to be able to offer somebody else something instead of just looking for someone to fix me. She already had a little boy. Her little boy became my little boy. I can definitely say one of the greatest gifts I have today is the ability to love someone unconditionally without fear of rejection. It’s the easiest to do with my children but I try to do it with everyone. I have a lot of love for humankind. David helped me to break that barrier. He was a ball of love. Becoming his “Da-da” solidified my place in the world. After about a year, I decided I was going to ask David’s mother to marry me. We dropped David off with his grandmother and boarded a plane to Hawaii. He was 20 months old. As we were flying to Hawaii, David died. He passed away from SUDC, which stands for Sudden Unexplained Death in Childhood. It is the greatest tragedy anyone can experience. There is no reason or scientific explanation. Recovery gives me the strength to face challenges and grow into a better person. If you look at statistics of families staying together through the loss of a child, they’re very bad. I was able to be present through that loss. At the time, I was a consultant at a private equity firm. It’s a thirty billion dollar company with offices around the world. The fact that I even had a job there is a miracle because everyone has a Master’s degree and I have my GED. When David died, the whole firm shut down and came to his services to show me love and support. A year or two later, the firm took me on as a full-time employee and hired me as the IT manager for their worldwide network. They paid me more money than I ever thought I would be able to make. 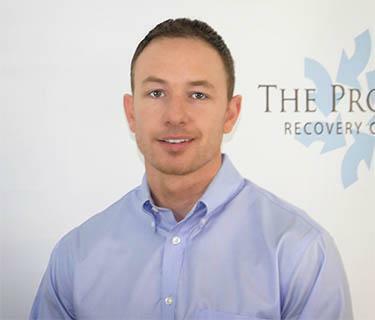 That allowed me to invest in recovery… which eventually lead to the opening of The Process Recovery Center. I never thought I would amount to anything. Today, I have twenty years clean. I’m the owner of a drug treatment center. I have two beautiful children. Everything that happened is a borderline fairytale, but I understand it all happened because of the underlying spiritual life that we live. I believe that spiritual principles are universal. Carrying yourself with humility, integrity, and honesty don’t just work for 12 Step recovery members; these principles works for all humans. Anyone can do this. There’s nothing special about me. It’s not just about using drugs, it’s about changing who we are. As addicts we destroy our lives. But the second we get clean, our life is prospering… whether we realize it or not. I try to help create that vision for the people with whom I work. I sponsor ten guys who have over five years clean. They have similar successes. I have a sponsee who is a graphic designer for Converse and travels the world. I also have multiple sponsees who own businesses. My best friend is an Assistant Attorney General – he’s got thirteen years clean. I’m surrounded by success stories. We all do the same things. We all practice spiritual principles. As a result, we all gain the same success. I would tell the newcomer: Just walk with us. It’s very possible for anybody to do this. I truly believe that. This is my life’s purpose. This is exactly what I’m supposed to be doing. I love addicts and I believe in them. There’s this perception that we are morally defunct people. When we are using, that is probably the truth, but we’re just sick. There’s a beautiful person inside. Using causes addicts to compromise who they are; to compromise their belief systems. On a regular basis, I see clients come in guarded, scared, and angry, and I see them blossom. All an addict really needs is someone to believe in them, love them, and show them the way. I’m fortunate that I’m in the 12 Step world. I see success all the time. I think our anonymity has hurt us a little bit because it tells us not to speak up about who we are and what we’re doing. There are many success stories just like me, just like my best friend, and just like all the guys I sponsor. We walk among you everywhere.